In the Autumn of 1989 my wife and I found ourselves in the ramshackle village of McLoed Ganj in the foothills of the Indian Himalayas. Quite by chance we had arrived on the day the Dalai Lama was returning to his exile home after being awarded the Nobel Peace Prize. Ornate and brightly coloured decorative arches had been temporarily erected spanning the narrow road. Rocks were being hastily whitewashed and scores of smiling, friendly Tibetans dressed in traditional clothes holding pungent incense and bunches of marigolds waited patiently behind a chalk line at the roadside. Everyone wanted to welcome their political and spiritual leader home and many people had been there for several hours. 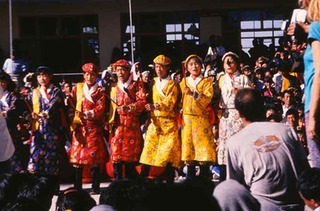 The Dalai Lama's Motorcade Tibetans dance in celebration. 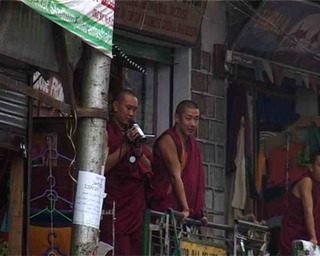 As the Dalai Lama’s motorcade swept by we caught a glimpse of the great man waving and smiling to his admiring people. So began my fascination with this unique and special culture. The Dalai Lama has become as one of the greatest and most well known spiritual leaders of our time. Now in his 70’s he continues to travel to many countries where he teaches the principles of Tibetan Buddhism and gives talks about the plight of the Tibetan people. About 130 thousand Tibetans live in exile throughout the world while in Tibet, which is about the size of Europe, the population is estimated at six million. 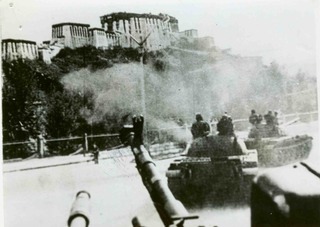 Tibet was invaded by the Chinese in 1950 and the occupation of the the country continues to this day. The opening of the railway from Beijing to Lhasa in 2006 now means that Tibetans will soon become a minority in their own land as more and more Chinese are encouraged to settle in Tibet. Meanwhile in exile the Dalai Lama continues his efforts to find a way to resolve the situation through peaceful means and in recent years special envoys have been sent to negotiate with the Chinese. Despite an optimistic attitude by His Holiness very little real progress has been made. For the past 50 years the Dalai Lama has lived in exile in India. As there has been a real danger of Tibetan culture dying out in Tibet or at least being seriously compromised he has made huge efforts to preserve Tibetan cultural heritage in exile. Buddhism and the monastic way of life has always been an integral part of the culture, so much so that in Tibet before the invasion nearly a quarter of the population were involved in monastic life. As the Chinese destroyed over 6000 monasteries in Tibet it was essential that those who fled into exile with the Dalai Lama set up monasteries and nunneries to keep the traditions alive. 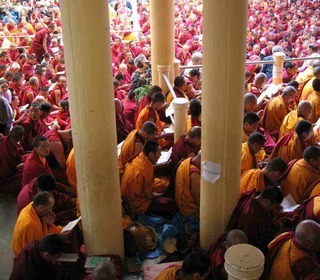 Today the Tibetan Buddhist traditions are being taught in monasteries and nunneries in exile and there is no shortage of Tibetans who want to become monks or nuns. The Dalai Lama continues to be the highest spiritual authority and an inspiration for all Tibetans. 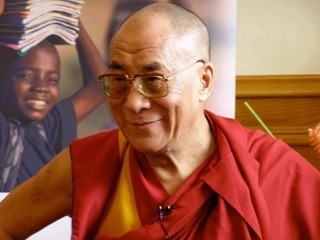 Secular education and the welfare of the younger generation have also been vitally important and the Dalai Lama maintains that it is essential for all children to be loved and cared for properly if they are to grow up as happy and fulfilled human beings. Many refugees died when they came into exile because of the hardships endured crossing the Himalayas and because life in India was so different from Tibet. As a result there were a great number of orphaned children in the first few years of exile. The Dalai Lama’s mother and sister set up an orphanage, which later became The Tibetan Children’s Village. Now there are about 15,000 children being educated and looked after by this organisation which has branches throughout India as well as in Bhutan and Nepal. As well as providing a place for the children to live, The Tibetan Childrens Village teaches the Tibetan language, traditional music and the history of Tibet. This is doubly important as most of the younger children have never been to Tibet. The TCV has also made efforts to prepare children for a life in the modern world. The Dalai Lama continues to be involved and visits the school at least once a year in October to celebrate the successes and achievements and to show his active support. The Dalai Lama plays a pivotal role in all aspects of Tibetan life, encouraging and supporting his people to find ways to keep their culture alive. His role as spiritual and political leader is unique. 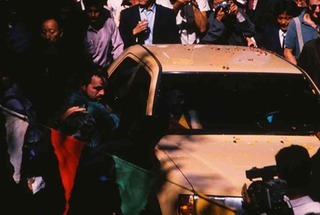 Unlike many other world leaders he would like to relinquish his political power and he continues to encourage Tibetans to think for themselves and have a say in the governing process. He has been a great advocate of political freedom and encouraged the setting up of a democratic Government in Exile. He hopes that one day this democratic system will be transferred to Tibet. As well as being regarded as their political leader Tibetans believe the Dalai Lama to be a manifestation of Avalokiteshvara, the Bodhisattva of compassion, the 14th incarnation in the line of Dalai Lamas and a ‘god- king’. The Dalai Lama often says that he is also just a simple Tibetan monk. The institution of the The Dalai Lama is unique. Tenzin Gyatso was born on the 6th of July in 1935 in the village of Takser in the province of Amdo and at the age of three he was recognised as the reincarnation of the previous, 13th Dalai Lama. From then on his life changed completely as he moved to Lhasa, the capital of Tibet, where he received his monastic education in the famous Potala Palace. There is a wonderful description of his life in those days in his autobiography ‘Freedom in Exile’, which he presented to me as gift when I met him in 1994. Over the years I have spent many months in Mcleod Ganj. 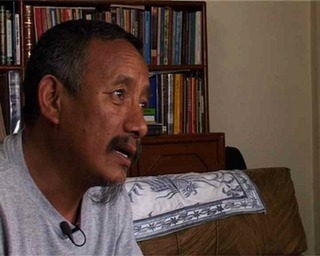 As my interest in the Tibetans grew I decided to make a documentary for RTE Irish radio (Click on link to listen to the documentary) about the situation in exile. One of the first people I interviewed was the Dalai Lama’s youngest brother, Tendzin Choegyal, who was once his private secretary. He told me that His Holiness has gained so much support for the Tibetan cause and that he is the guiding light for all Tibetans. He said that his brother is a wonderful teacher and that he encourages people to think for themselves and to be creative. What has really affected Tendzin Choegyal is the Dalai Lama’s personal lifestyle, which he feels is so inspirational because of its simplicity and purity. Tendzin Choegyal encouraged me to seek an audience with His Holiness. Even in those days the Dalai Lama had a busy schedule but somehow it was arranged for me to have a meeting with him. On the day after Christmas in 1994 I went to his residence in McLoed Ganj and met this wonderful man. The interview lasted for half an hour and His Holiness spoke at length about teaching children the need for compassion and forgiveness and his belief in a non violent approach to conflict resolution. At first I was quite nervous about meeting such a famous world leader but after a few minutes that disappeared. His honesty and sincerity put me at ease. I found it refreshing that when he did not have an answer he just laughed and said, “I don’t know!” He also told me that he had a special fondness for Ireland, the country where I live, as it was one of the few countries in 1959 that actively sponsored a resolution in the UN to help Tibet. As we posed for a photo I felt very fortunate to have had a meeting with such an extraordinary person. When I revisited McLeod Ganj and Dharamsala in 2004 I was shocked by what I felt was a deterioration in exile life and particularly how this was effecting monastic life and young Tibetans. What was once a peaceful and relatively isolated town was now a major place on the the tourist trail. The modern world had arrived with mobile phones, internet cafés and cinemas showing western films. Many more hotels and restaurants had been built and the atmosphere had become very commercial, with taxis and rickshaws now blocking what were once quiet streets. It became clear to me that despite the boost to the local economy, many aspects of traditional Tibetan life were under threat. After seeing these changes I decided I had to make a film about what was happening in exile. I felt an urgency to highlight the plight of the Tibetans in exile and help raise world awareness of the situation in Tibet. 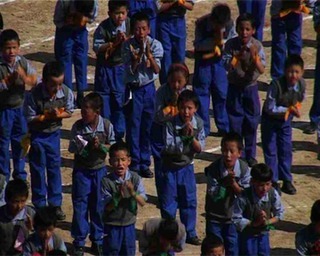 During the three years that it took to make this film, entitled ‘THE TIBETANS. A LIFE IN EXILE’ I was touched by the passion of the participants and saddened by the fact that the traditional way of life in exile was being eroded. It also seemed that the possibility of a return to Tibet was becoming less and less likely. One of the tenets of Buddhism is that everything is impermanent and nothing lasts forever. I often wondered if a prolonged life in exile would result in their culture changing beyond recognition. Most Tibetans still passionately believe that someday they will return to their country, and as time is passes it has become critical that they find a way to return within the lifetime of the Dalai Lama. Lhasang Tsering, Former Youth Congress Leader. 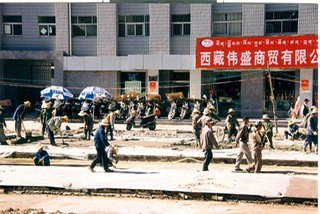 Divisions exist about how to achieve a return to Tibet. Lhasang Tsering, who was a freedom fighter in the 1960’s and former Youth Congress leader, spoke candidly to me about how difficult it has been for Tibetans to resolve this issue within themselves since the Dalai Lama adopted the ‘Middle Way’ approach and opted for autonomy under China. Some people find their reverence and veneration for the Dalai Lama to be at odds with their need to keep believing that they can return to a totally free and independent country. In the 1980’s it became apparent to the Dalai Lama that continuing to ask the Chinese to agree to a restoration of Tibet’s complete and absolute freedom was not making any progress. He came up with the Five Point Peace Plan and the Strasbourg Proposal which became the basis of what is known as the Middle Way approach. If this was put into practice it would mean that Tibet would still be part of China, which would control defence and foreign affairs. Tibet would be demilitarised and Tibetans would have control over domestic issues. The Tibetan Youth Congress, numbering fifteen thousand, is the only organisation that still campaigns for a completely free Tibet. To this day neither of these approaches have been accepted by the Chinese, and despite a tolerant attitude by His Holiness to the Free Tibet movement it has had, in my opinion, a serious effect on Tibetan unity. The Dalai Lama, or Kundun as he also called by Tibetans, is the lynch pin of Tibetan society. It is his leadership that is keeping his people together and although he has tried to step back from his political role and become semi retired this is not what most Tibetans want. He continues to work to help make the world a better place by inspiring others to find ways to come to a better understanding of the similarities between people rather than the differences. He travels to many different countries and has written several books. Some are about the esoteric Tibetan teachings, others are about his philosophy of life, which is to seek joy, fulfilment and happiness through compassion and by being kind and honest in all one’s dealings with others. He says if we realise that everyone on the planet is connected then by harming others we also harm ourselves. If we harbour ill will and hatred we will only find unhappiness until we are able to forgive. In a world that remains full of conflict and its resulting misery it is this message and the person who is delivering it that makes the Dalai Lama the visionary the world so desperately needs.